Everyone’s excited about salvation–are you? Let me describe a person you don’t want to be. I will give you the definition and you see if you can guess the term. Christians are never to be joy killers–we are actually to be joy fountains. Never be a VDP (very draining person), but be a VJP–a very joyful person. Be a Tigger, not an Eeyore. Verse 9 ends with “salvation” and verse 10 begins with “salvation”. This is so cool–the salvation we believers experience now, which will be completed in the future (verse 9), was prophesied in the past (verse 10). We who are believers in Christ are the fulfillment of prophecy! But salvation by grace alone, through faith alone, in Christ alone was never meant to be merely a theological or historical musing–it was always meant to radically change our lives and fire us up! Yet if you don’t focus on it, you are going to miss a ton of blessings in your life and find yourself distracted by this world. The reason so many so-called Christians are attracted to this world is their ignorance of the Word of God, and their lack of understanding of the salvation they have in Christ. There is a moth that actually flies a perfectly straight line – it uses the light of the moon as its guide and can fly perfectly straight – until it gets distracted by other lights! Where do you typically see moths? – flying around porch lights, fluttering around, hitting the light and spiraling down to the ground. This is also where I see praying mantises, who eat the moths. This is exactly like a lot of Christians – they have lost the huge light of the cross, the gospel and Christ, and as a result they are distracted by the lights of the world, banging their heads, spiraling out of control, and are open to predators. When your affections are not set on the things above; you begin to focus on the things below; joy is robbed and hope vanishes. You get excited about the next game, the next event, the next child, the next raise, the next vacation and as a result . . . the things of this world have become your pre-occupation more than your salvation, heaven, learning the Word, and seeing all of life through God’s lens. Unless you’re convinced there’s something greater than this life, the things of this world will rob you of your appreciation for the cross, Christ, the gospel and heaven forever. I was a secret rebel who tried almost everything the world had to offer at least once by the time I was 18 when God saved me and everything changed. All my friendships, my major at school, my purpose, free time, what I read, who I hung out with, everything changed dramatically. I was on fire – but over the course of two years, a lot of my new life became routine and less joyful. Then I learned if I didn’t concentrate on the greatness of my salvation, how lost I was, how I still needed Christ every day–if I didn’t live dependently on the Spirit and saturated with the Word of God–then I was doomed to living a mediocre life as a mediocre Christian, hopefully saved but so little different and always unsure. Unless you’re convinced of something greater, even your normal responsibilities can rob you of your appreciation for your Lord and Savior, Jesus Christ and the salvation He gives. Peter understood well that salvation was not merely inviting divine blessing on your life, but true salvation also invites trials, suffering, persecution and possibly death in your life. So as Peter writes his readers in 1 Peter 1, he was addressing a group of believers who were disenfranchised from their culture. Jewish Christians were rejected by their families for turning to Christ and Gentile Christians were rejected by their friends for living in obedience to New Testament morality versus the immorality of the day. And now, these believers had been sent away from Rome and sent to the Black Sea region of Asia Minor, punished because they followed Christ. According to Rome, they were troublemakers because they assembled together, sought to convert Roman citizens, and confronted the morality of their day. So Rome shipped them away and they have to start over with no job, no friends, in a hostile place where they are jailed, and some may be killed by people who are automatically suspicious of them because they believe the gospel. As Peter continues to pour out his heart in this single opening sentence from verse 3-12, he concludes this first major thought with a reminder of just how great the gospel is. He wants to motivate them by sharing the example of three groups who were also impressed by just how great our salvation is. He desires to encourage them and us by the example of others who were fired up by the same salvation we have been so graciously given. Today, if you are discouraged, weighed down, burdened by trials, losing your joy, or falling into routine, then allow God’s Word to re-orient your affections and help you re-discover your joy because of the greatness of the salvation you have in Christ –and a few of you can discover the salvation you could have if you turn to Christ in repentance and faith. Here are three passionate pursuits of salvation by three different groups. Three models of salvation enthusiasm for us to be influenced by . . .
We know these are not New Testament prophets, because the NT prophets knew who Christ was and that he’d already come – these are the Old Testament prophets here, and the OT prophets are an example of enthusiasm about salvation. What kind of salvation do they describe? First, it would be an old salvation Verse 10, “the prophets who prophesied” predicted a salvation of grace that would come, but they were not describing anything new. In fact it is very old. Salvation by grace alone is first discussed in Genesis 3:15. The proto-evangelium, or First Gospel, is Genesis 3:15, “And I will put enmity between you and the woman, and between your seed and her seed; He shall bruise you on the head, and you shall bruise him on the heel.” Here, the singular offspring of the woman (we know Him to be Christ) will crush the enemy’s head (we know him as Satan–the one who was the influence behind the actions of the serpent). The promise here is of a coming seed, a promise repeated through the entire book of Genesis and throughout the entire Old Testament. God was at work bringing about redemption to a rebellious human race from the very start. God would do it for us – that’s His grace. The gospel is very old – but we can go back even further before Genesis if you remember what Peter said when he began this letter. At the end of verse 1, “to those who reside as aliens…. who are chosen 2 according to the foreknowledge of God the Father,” and add Ephesians 1:4, “just as He chose us in Him before the foundation of the world . . .” Our salvation, the prophets predicted, was put in motion by God before the world was even made. Ours is an old salvation. It is eternal, described in the Bible for thousands of years. The prophets taught and wrote God’s inspired Word. Our mandate is to understand it correctly in its historical context, bridging the gap of history, language, culture–which is why we use the Greek language plus study to determine the one correct interpretation for every text. Only after that, do we apply the Word to our situation today–one interpretation for every verse of the Bible, many applications. Read 2 Peter 1:20, “But know this first of all, that no prophecy of Scripture is a matter of one’s own interpretation.” Don’t ever say, “This is what the Bible means to me.” It doesn’t matter what it means to you, it only matters what God meant it to say at that one time. We want the author’s intended meaning, or the authorial intent. What the Bible means to you is irrelevant. It doesn’t matter. What it means to you isn’t what it truly means. It is not about your own private interpretation. Take “to me” out of your thinking. This is what it means period. This is what Peter intended to say period, regardless of what you think or I think. Again, I want to say this every week – don’t listen to what I say, listen only to what the Bible says period. It’s not about me, it’s all about the Word of God. Peter goes on in 1 Peter 2:21, “For no prophecy was ever made by an act of human will, but men moved by the Holy Spirit spoke from God.” They didn’t just make this stuff up – that’s crazy talk. Can you imagine the prophets getting together and saying, “Let’s come up with a suffering servant Messiah who gets killed to take our punishment for sin so we can give Him our sin and He can give us His righteousness . . . yeah, what a good idea.” Plus, how did the prophets coordinate their secret plan over the course of 3,000 years? That’s a neat trick – no! They didn’t make this up – they were moved along by the Spirit. God did not dictate His Word to these men, nor did God elevate their words to become His Words. 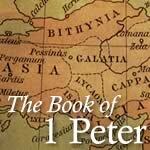 It was not, “one word is Peter’s, then one word is God’s.” No, God inspired the prophets and apostles and moved them, so that the Bible is 100% God’s Word, using all 100% of these men. The Holy Spirit superintended the writers of Scripture so that, while writing according to their own styles and personalities, they produced God’s Word written, authoritative, trustworthy, and free from error in the original manuscripts. Like taking an escalator, they were moved along to God’s exact desired end, but each fully participated in the process. My job is to get the food from God’s kitchen to this table without messing it up. And your job is to study the Word, first to find out what it meant in its original setting, then second, to apply it. Movements come and go, new approaches never cease, but God wants us to stick to the foundation of His Word. 1 Peter 1:25, “the word of the Lord abides forever.” Don’t buy the on-going and repeated lie that new ideas can possibly replace the Word of God, the gospel, or the cross of Christ. The gospel is very old, not new. We understand it only by looking at the Word of God. Second, it would be a gracious salvation Verse 10 “As to this salvation, the prophets who prophesied of the grace that would come to you.” The term grace is similar to the Greek words for joy, bless, favor and gratitude. But here it is God giving us what we don’t deserve. The salvation message is this: you can’t save yourself from God’s anger over your corrupt nature and sinful acts, so God made a way to save you from Himself. You and I are saved by God, for God, from God! And it was God’s grace giving us what we don’t deserve that the prophets preached. Unmerited, unearned, undeserved favor. The Old Testament gives us law after law, indictment after indictment, judgment after judgment, prophecy after prophecy against the sins of God’s people for their failure after failure after failure. By the time you get to the end of Malachi and its utter despair, there was no solution–they couldn’t be good enough, they couldn’t try hard enough, and those who said they could only externalized their faith and ignored their evil motives, desires, wicked thoughts, jealousies, ambitions and other sins of the heart! Many tried on their own merit to earn God’s favor, but the prophets kept saying, you can’t do it. Grace was needed. Salvation is not by good religion, only by God’s righteousness. God alone can enable you to do what He alone will be pleased with. Habakkuk 2:4, “But the righteous will live by his faith” –dependence on what God has done. The prophets knew God’s salvation was a gracious salvation. Do you recall how much Jonah struggled with God’s graciousness? Turn to Jonah 4 – Jonah wanted God to wipe out the Ninevites, so listen to Jonah’s complaint in verse 2, “And he prayed to the Lord and said, ‘Please Lord, was not this what I said while I was still in my own country? Therefore, in order to forestall this I fled to Tarshish, for I knew that Thou art a gracious and compassionate God, slow to anger and abundant in lovingkindness, and one who relents concerning calamity. '” The salvation we enjoy is a salvation of grace. We come to Christ, not based on anything we can do to earn His favor, but by His grace alone. He gave us what we needed. No one is good enough or religious enough to save themselves, and what is needed from God, is offered by God. I once went to a banquet unknowingly unprepared. I was dressed in the dirtiest, messiest clothes I had–they were horrible. Everyone else was in shirt and tie. I did not belong! It was very embarrassing. What I needed was for the host to provide me with a shower, soap, shampoo, towel, changing room and a fitted tux and dress shoes. Had he done that, it would have been just like Christ did for you and me when He saved us. Heaven is His banquet and only He can wash you and dress you, and get you ready so you can attend the feast! Only God can provide you with what you need to sit in His presence. You enter God’s banquet only with Christ’s own provisions by grace. The salvation we celebrate is an old salvation by grace and . . .
Third, it would be a researched salvation Look at the end of Verse 10 “The grace that would come to you made careful search and inquiry.” This didn’t come from their own ideas or weird religions of their day, they researched the Scripture themselves. We know Daniel read his fellow prophet Jeremiah, which led him to pray about the return of the Jews to Israel. They studied the Scriptures and examined their own prophesies, and would ask, “Who will it be, and what will it be like?” They wanted to know! The strong emphasis in verse 10 is the two verbs “search and inquiry”–both these words are similar in meaning, but put together they make a huge statement about the prophets’ hunger to know the details about salvation. The Greek word “search” contains the aggressiveness of a prosecutor seeking to bring charges against a public enemy. And “inquiry” is the super investigative examiner – when it came to salvation, the prophets were the Hercule Poirot of their day. They put their little gray cells to work! What did they research? Verse 11 “Seeking to know what person or time the Spirit of Christ within them was indicating.” The Holy Spirit gave insight; He was prompting the prophets to anticipate the coming of the Savior. The Holy Spirit is the third person of the Trinity. He didn’t permanently indwell the Old Testament saints, but He was working in the prophets and He does permanently indwell all true believers. The Spirit seals you for salvation, gifts you for service, and fills you with His presence as you serve and share the gospel, and demonstrates He’s in you through His fruit, making you loving, joyful, peaceful, patient, kind, self-controlled and more. And they were investigating the Word of God, asking the Spirit of God to make it clear Who it was and when He was coming! Verse 11 says, “the Spirit was indicating.” Indicating means make it clear. What do they want clear? See verse 11 to know what person or time. The Spirit of God is the One who inspired the Old Testament prophets and the New Testament apostles to record the Word of God just as Jesus promised to the apostles in John 14:26, “But the Helper, the Holy Spirit, whom the Father will send in My name, He will teach you all things, and bring to your remembrance all that I said to you.” So the Spirit inspired the writers to give us the Word of God. And this same Spirit motivated the Old Testament prophets to seek out Who it was and when He was coming. They were saved the same way we are, but did not get to see all that we have about Jesus, the cross, and the resurrection, plus all the rich teaching on what these all mean to us. You remember Simeon, don’t you – one of my favorite prophets. In Luke 2:25ff, he took the Word of God seriously. 25 “Behold, there was a man in Jerusalem whose name was Simeon; and this man was righteous and devout, looking for the consolation of Israel; and the Holy Spirit was upon him. 26 And it had been revealed to him by the Holy Spirit that he would not see death before he had seen the Lord’s Christ.” Can you see Simeon . . . is it Him? . . . no, not this one . . . when’s He coming? God gives him a divine insight as to Who it would be. “Simeon, it’s not a warrior, nor king, but the one in diapers.” Finally, he takes Jesus in his arms and tells Mary one day your heart will be wounded – because He will bring salvation – but it will be by His death! Then Simeon says, now it’s time for me to die, I am ready for heaven – I’ve seen the Savior. Don’t you love Simeon? So Peter is motivating his suffering readers by reminding them we now in the New Testament have more clarity and intimacy, than they did in the Old Testament. Peter says we’re in a better place since we can see who it was– we know that our salvation comes through Jesus! You know more of Christ then they did. And they were pumped about this coming salvation. They were so excited they studied, researched and questioned. All scripture ultimately points to Christ. John 5:39, “You search the Scriptures, because you think that in them you have eternal life; and it is these that bear witness of Me.” How much more excited should you be because you know more! And just as they looked for salvation to be accomplished, you should be looking for salvation to be finished. Be enthused–you can open your Bible and read of Jesus Christ. So salvation would be old, graced, researched and . . .
Fourth, it would be a bloody salvation Verse 11 “Seeking to know what person or time the Spirit of Christ within them was indicating as He predicted the sufferings of Christ.” Turn to Isaiah 53. The Holy Spirit told the prophets that salvation would be bloody. They knew the Messiah would have to come and suffer for the sins of God’s people. Just read Isaiah 53–you know it. This is what Jesus Christ did for you. 4 “Surely our griefs He Himself bore, and our sorrows He carried; yet we ourselves esteemed Him stricken, smitten of God, and afflicted. 5 But He was pierced through for our transgressions, He was crushed for our iniquities; the chastening for our well-being fell upon Him, and by His scourging we are healed. 6 All of us like sheep have gone astray, each of us has turned to his own way; but the Lord has caused the iniquity of us all to fall on Him.” The prophets were saying the One who would come would be a suffering Messiah, a Lamb led to slaughter, a substitute for those who should be slaughtered themselves. The central focus of our salvation is the bloody crucifixion of Christ for our sins. We should think, sing, meditate upon and memorize the Word of God about the Christ’s atoning death, over and over and over again. May we never stop thinking about what they were pointing to, that the Messiah would suffer for our sins. It should make us all the more grateful for Him, because we’re the ones who deserved all the suffering. Peter’s writing about the sufferings of Christ is to encourage those who are suffering now for Christ. Nothing you go through can compare to what He went through. There is power in the cross. Recently I officiated at a funeral for a strong Christian family who had lost their 18-year-old son. They were and are trusting Christ, yet my own heart broke as we pulled up to the graveside, and upon seeing the casket, the entire family broke down with an outpouring of sorrow in uncontrolled heart-breaking weeping. I asked the Lord, “What do you want me to do or say right now?” And I believe He impressed me to share the gospel. What I had in my notes was good, and the gospel was repeatedly and clearly referenced in my remarks later; but I had not planned on beginning the graveside with the salvation message, and now I did. As I started to speak, I immediately began to talk about the suffering of Christ on the cross for our sins, what He went through physically and how He bore God’s wrath for our sin. As I watched their faces, they changed from despair to hope, from defeat to dependence, from trial to trust. I watched God bring hope to the dead boy’s father, mother, brother and sisters. Christ suffered more than anyone has ever suffered and He did it for you. The word “suffer” in verse 11 has a lot to do with “unfair!” Christ took the ultimate unfair suffering for us – we should be in hell, in eternal torment, alienated from God forever, but we are not, because of Christ. What is shocking is this: instead of running away from suffering, Jesus actually stepped forward toward suffering for us. In Gethsemane, when Jesus was praying right before His six unjust trials which led to the cross, the Bible says something shocking in John 18:4, “Jesus therefore, knowing all the things that were coming upon Him, went forth, and said to them, ‘Whom do you seek? '” Jesus knew what was going to happen, but He actually went forth – He came up to them, He stepped forward, He went toward them. I would have run from suffering, but Christ embraced suffering. Think about what He did–on purpose, intentionally. He allowed others to put nails through His hands and feet, then hang Him nailed to a cross for six hours, bleeding, in continual pain, as He writhed up and down, pushing Himself up and down in order to breath. The last three of those six hours, He bore the entire weight of God’s wrath for our sin in order to be able to say, “It is finished!” Wait, it was a bloody salvation and . . .
Fifth, it would be a glorious salvation The prophets were . . . Verse 11 “seeking to know what person or time the Spirit of Christ within them was indicating as He predicted the sufferings of Christ and the glories to follow.” Think about the contrast between the humility of his sufferings and the glories to follow. The obscurity of His birth and childhood. No one knew who He was for 30 years. The average guys He picked for His team – the betrayal of a close friend, the opposition of religious leaders, His trials, beatings, and the death of a criminal. His entire life was filled with unfairness, misunderstanding and suffering. Yet, He bore those sufferings willingly. And God glorified Him to the highest place in all of heaven. The Greek word for “glories” also means splendors–students say “awesomes”. The basic root word “glory” carries a sense of honor and reputation. Glory is the summation of all of God’s attributes. Glory is the totality of God’s being – it is all of who God is. So once Jesus accomplished the suffering for our sin upon Himself and rose from the dead, then these glories that belong to Him would follow after. Giving God glory is giving Him something He doesn’t already have, it’s giving Him the honor He so richly deserves. The word “glories” is plural and that is rare–Peter is referring to multiple glories. Some think the phrase, “the glories to follow” means the glories follow after us when we die, while others believe it means the glories followed after Christ when He died – I think it’s both. Christ goes ahead and takes the lead and all these glories follow after for the rest of us as well. God is telling us this life is filled with suffering but there are great glories to follow – it is a future glorious salvation. So salvation would be old, graced, researched, bloody, glorious, and . . .
Sixth, it would be a delayed salvation Verse 12 “It was revealed to them that they were not serving themselves, but you.” After the prophets did all their research, God revealed to them that this coming salvation would be fully realized in the future. They’d have to wait – this salvation was delayed for them. Verse 12 literally says, they didn’t get it at first, but now it has been unveiled. They didn’t see it right away, but now it’s clear. What was made clear to them? The Prophets were continually serving us (Peter’s readers and us). The verb “serving” is unique–it means continual action in past time. They were laboring, suffering, prophesying continually in the past for you. And what you have in your lap is evidence of their labor for you. Look at your Bible–see that Old Testament, the first two-thirds of your Bible, those first 39 books – that was written, bled over, died for, preserved for thousands of years, all of it was to serve you. The prophets were not going to receive the full manifestation of God’s salvation themselves, but they finally understood that you, not they, would see that day; you would know who Christ is, and you would know when He came and what He did for you. Praise the Lord! And Peter’s also been telling us in these first twelve verses that we New Testament believers have some waiting to do as well. We are waiting (verse 4) for heaven, (verse 5) ultimate salvation, (verse 7) reward, (verse 8 ) to see Christ, and now (verse 11) glories to follow. The prophets had to wait for Christ to be revealed and we have to wait for Christ to return – until then we suffer in this life, but we rejoice in our salvation. I don’t believe the prophets thought their waiting was unfair, even though they didn’t see what we have today in salvation. It’s true, some prophets were even killed. Tradition tells us Isaiah was sawn in half, but I can imagine him saying before he died, “I didn’t see it, but I am about to see Him.” The prophets sought salvation, longed for it, sought after it, thought about it, searched the scripture for it, and they celebrated it. So . . . should . . . you! In one crucial battle, the only officer remaining in this tank against tank engagement was a Major – in the heat of battle, he received a hand delivered note through a courier from his friend and General. The note read, “Mark – unless you immediately protect your right flank, you will be overrun and the battle lost.” Unable to see his right flank, or receive proper intel, merely on the basis of a note, the Major had to commit a serious number of tanks to his right flank, which now would leave him wide open on the left and front. But he did, and won the battle. You do not see all that is going on in this life, but your commander has sent you a message through His couriers, the prophets, and He is telling you that all will be lost, unless you commit completely to Christ through repentance and faith. Do it now, before you are overrun to your eternal ruin. And the rest of us should be continually giving thanks that God gave us ears to hear and eyes to see how crucial that message is. Celebrate the gospel today, share it with others, live it moment by moment . . . all for His glory! Are you excited about your salvation?